- Saturday I wanted to push myself and do a little speed hiking / trail running over moderate & easy grades of ten plus miles. 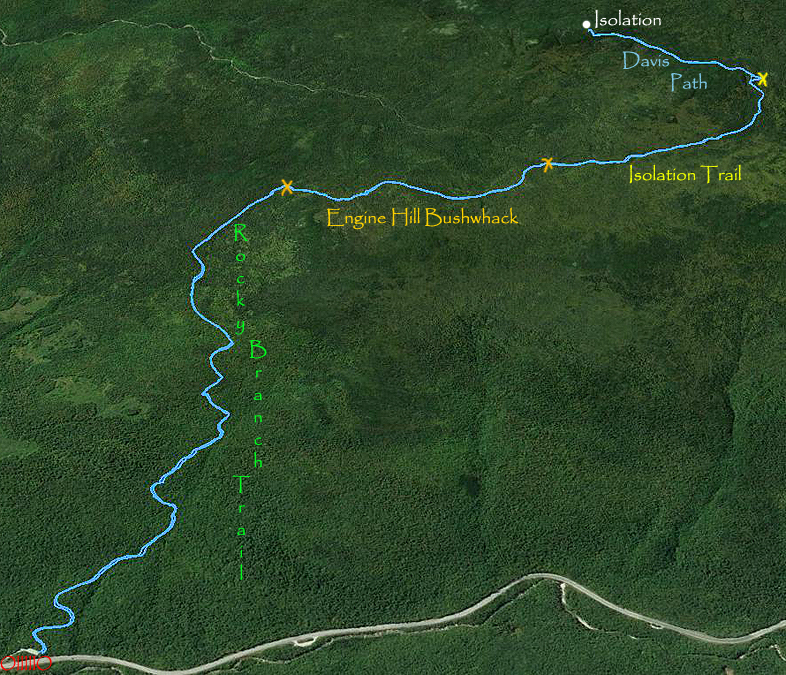 I headed south through Pinkham Notch to do a run of Isolation as part of my RUN NH48 (click here for run data). - I pulled into the Rocky Branch trailhead just after 8AM, There were already several cars in the lot as other hikers were taking advantage of the great weather. As I was getting my gear together I was greeted by Rachel who was about to set off to hike with a few friends, Rachel has hiked an impressive 28 4,000 foot peaks since winter started! - I started off along the old logging road that makes up the bottom section of the Rocky Branch Trail, the first mile and a half contains the most consistent grades as it crests a hill following this old road over a few switchbacks. Along the way I ran into Summerset, another experienced hiker who was out enjoying the early morning along the trails with a few of her friends (click here for her blog). - The Rocky Branch Trail soon levels off and grades ease as it passes the wilderness boundary on the way to the height of land. I ran into a few more hikers over this stretch, finally passing by the first people setting tracks prior to entering the Engine Hill Bushwhack. - Just before the three mile mark the Rocky Branch Trail continuous straight ahead, here I banged a right and headed through the wonderful birch glades of Engine Hill. 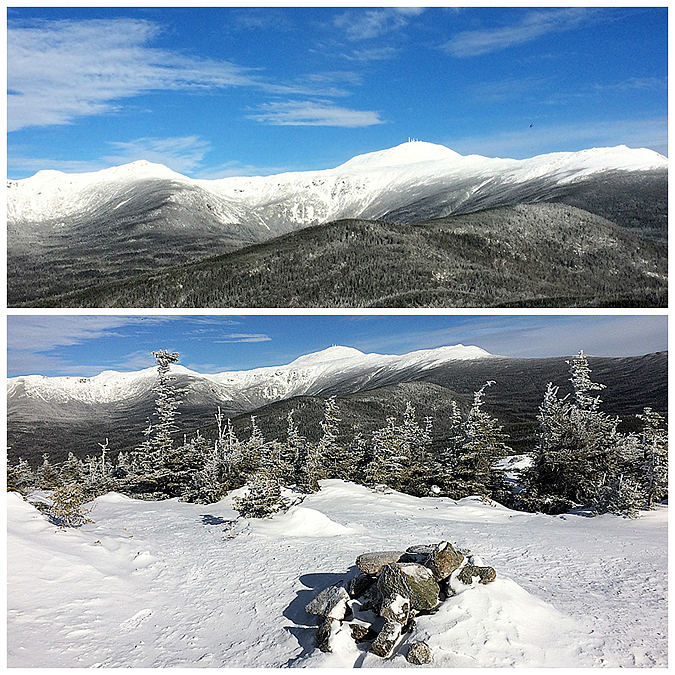 I was happy to be ahead of everyone after last night's snow flurries that left behind some fluffy snow. 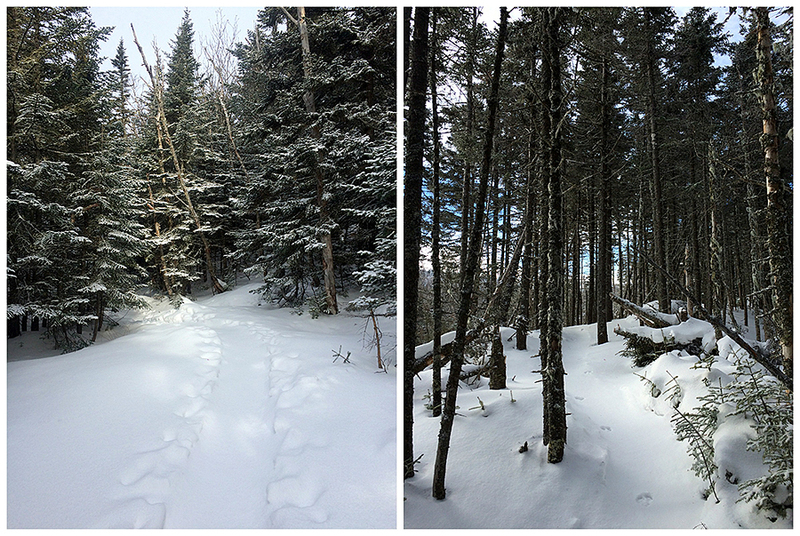 There wasn't much new snow, maybe an inch, two at the most, but in the wide open spots through the glades and up along the ridge it was wind blown enough to fill in the tracks making for a nice winter wonderland solo hike/run. - After spending a little over a mile in and out of the glades the whack dumped me out on the Isolation Trail a few tenths of a mile below the three highest water crossings, two of which were bypassed by a nice herd path. The climb up to the ridge on the Isolation Trail is very gentle as it intersects the Davis Path about a mile north of the summit. From here to the summit is more easy/moderate grades as it quickly makes it's way up to the summit spur where the steepest part of the hike is, over the final three hundred feet to the summit. - I timed the hike perfectly up to this point as the sun was still out, there was no wind, and the Presidential Range north of Mount Pierce was in the clear making for phenomenal views. - I only took a break of a few minutes to snap some pictures and refuel before starting my run back down the mountain, as I had a goal of trying to complete the twelve mile out and back in under three hours. So at the 1 hour and 50 minute mark I started my run down. - On my way out I ran into many hikers heading up, around thirty, and five dogs too. Everyone I came across was in high spirits, how could you not be on such a fine winter day! I passed by Summerset again, Rachel and her friends, Michael Blair and a group he was leading (click here for more info on Random Group of Hikers), and for the second straight week I ran into Franco! Always a pleasure crossing paths with everyone. Other hikers I passed by looked familiar from Facebook pictures from mutual friends albums but I couldn't match names with faces, but hello to you all, too! - The last three miles out on the Rocky Branch Trail from the Engine Hill junction I had the trail to myslef so I really opened it up and sprinted back to the Jeep finishing under three hours and achieving my goal. Not a bad way to start off a Saturday morning! 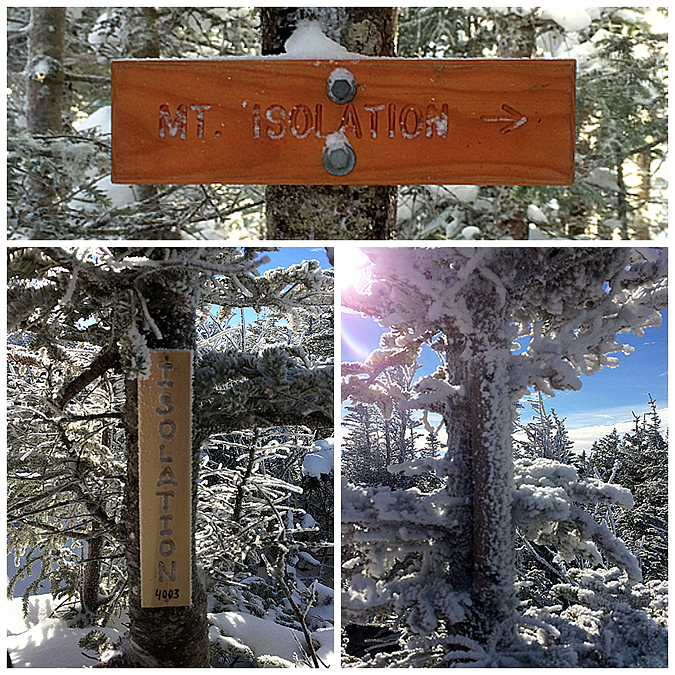 The Isolation sign marking the short spur path to the summit, along with the two summit sticks. The new one on the left, these summit sticks are appearing on more and more summits. The old one is on the right, they're both on the same stunted pine tree, the old one is higher up. Nice seeing you out there, Chris! Congrats on making your time goal - always inspiring!